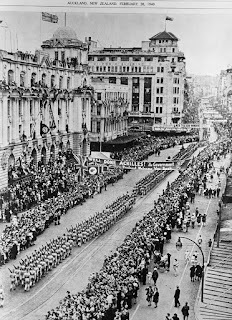 As the City Rail Link (CRL) project begins and Lower Queen Street has become predominantly closed to traffic, we take a look back at the varying ways that the space has been used. 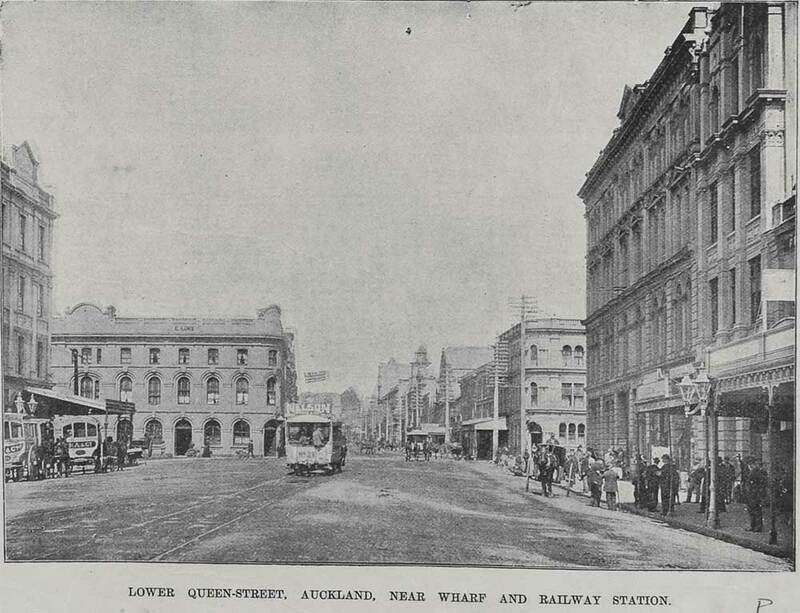 Lower Queen Street, between Customs Street and Quay Street, currently sits on reclaimed land that used to be part of Commercial Bay. Reclamation works in the area occurred between 1875 and 1886. 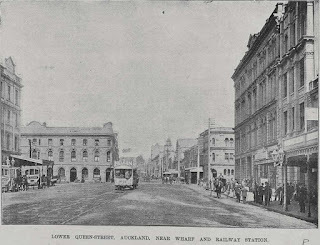 Ref: Auckland Weekly News, Lower Queen Street Auckland near the wharf and Railway station, 7 December 1900, Sir George Grey Special Collections, Auckland Libraries, AWNS-19001207-7-2. 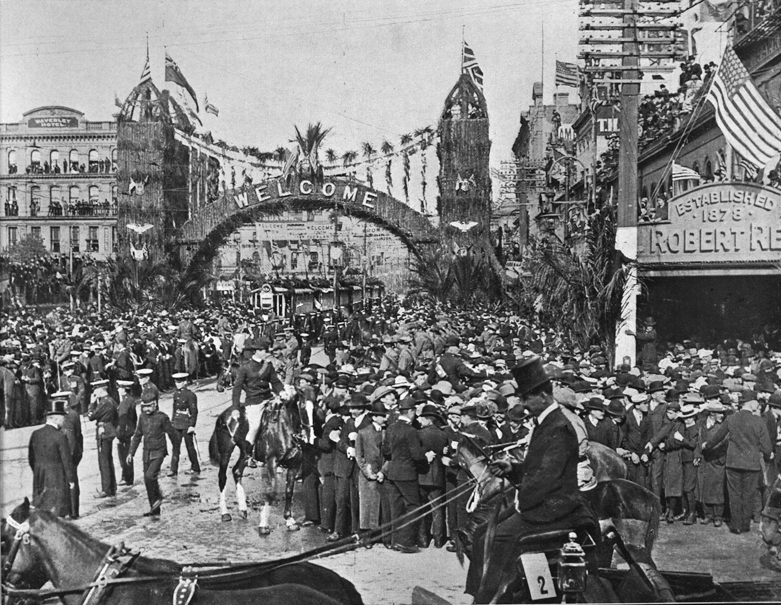 Ref: Auckland Weekly News, A crowd of people in front of the welcome arch erected in lower Queen Street for the visit of Admiral Sperry and the American fleet, 10 August 1908, Sir George Grey Special Collections,Auckland Libraries, 7-A11730. 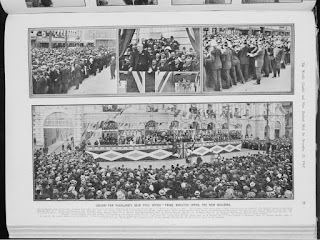 Ref: Muir and Moodie for the Auckland Weekly News, The main thoroughfare of New Zealand's great trade centre, 3 June 1909, Sir George Grey Special Collections, Auckland Libraries, AWNS-19090603-7-1. 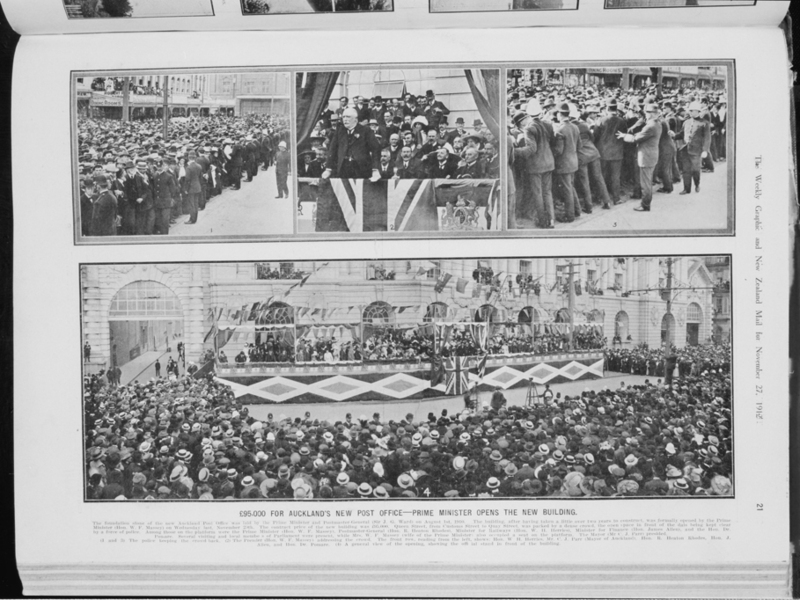 Ref: Weekly Graphic and New Zealand Mail, Opening of the Central Post Office, Auckland, 20 November 1912, Sir George Grey Special Collections, Auckland Libraries, 7-A15618. Construction on the Chief Post Office building began in 1909 on this reclaimed land. 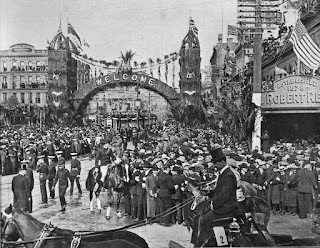 It was opened on 20 November 1912 by Prime Minister William Massey in front of a big crowd of Aucklanders. The tram terminus in Lower Queen Street, and proximity to the port and rail, had guided the placement of the CPO. 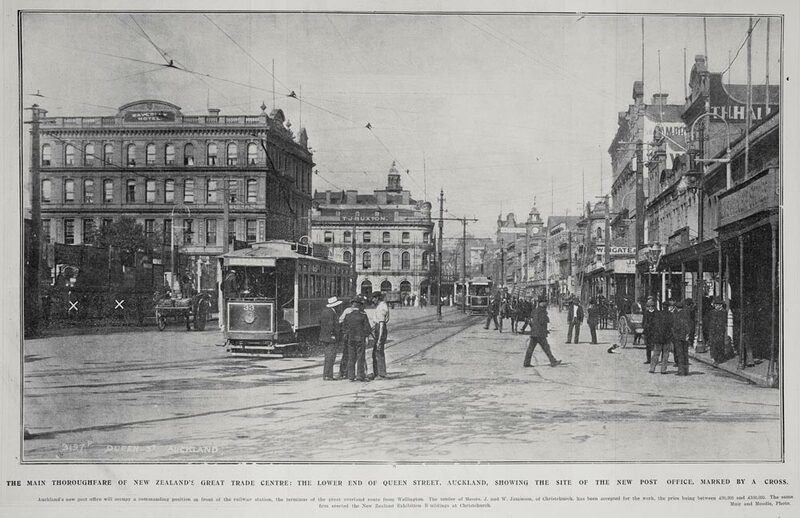 Trams were a major part of this area from 1902, until their final trip in 1956. 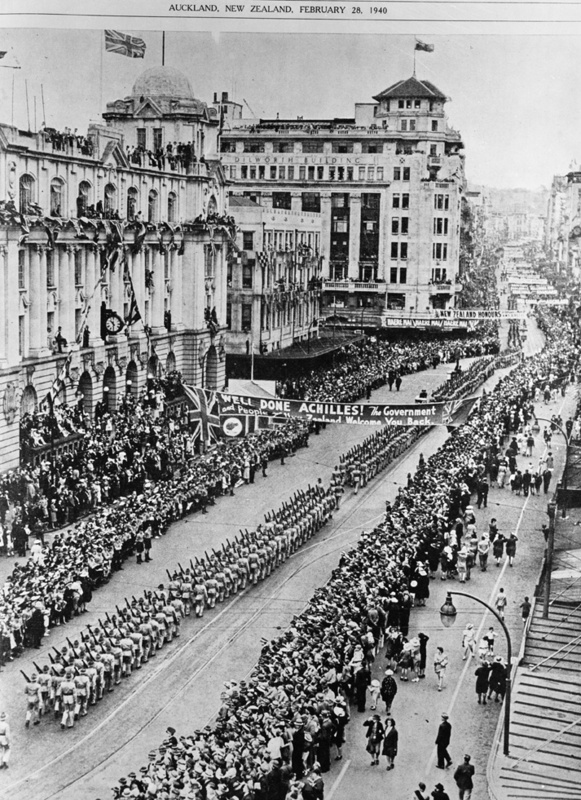 Ref: Auckland Weekly News, Men from HMS Achilles parading on Queen Street, 1940, 23 February 1940, Sir George Grey Special Collections,Auckland Libraries, A4389. 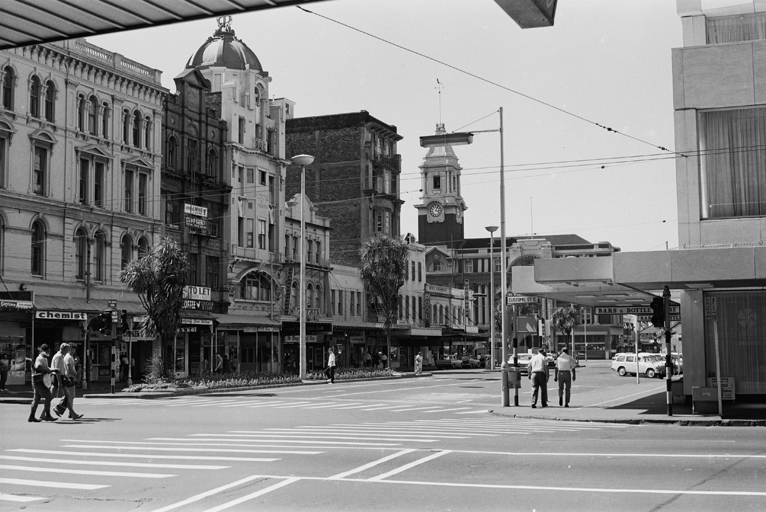 Ref: Auckland City Council, Looking up Queen Street from Quay Street, 17 Sep 1963, Sir George Grey Special Collections, Auckland Libraries, 580-7806. Ref: N M Dubois, Lower Queen Street, c1973, Sir George Grey Special Collections, Auckland Libraries, 786-A010-1. 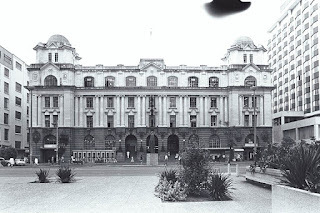 Ref: Auckland City Council,Showing the Chief Post Office and statue of Maori chief, 1960s/1970s,Sir George Grey Special Collections, Auckland Libraries, 435-A5-38A. 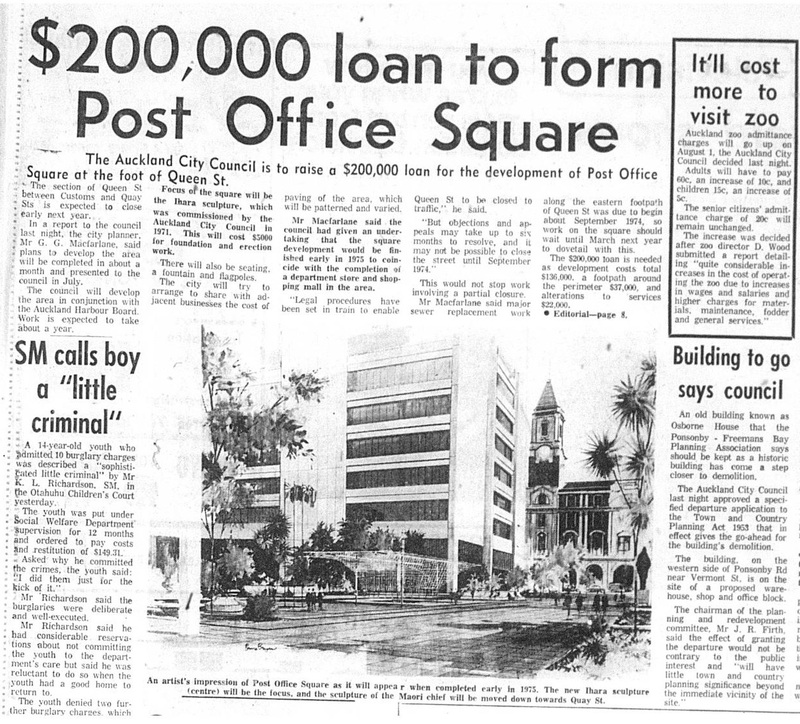 Ref: Auckland Star, 31 May 1973, p. 9. 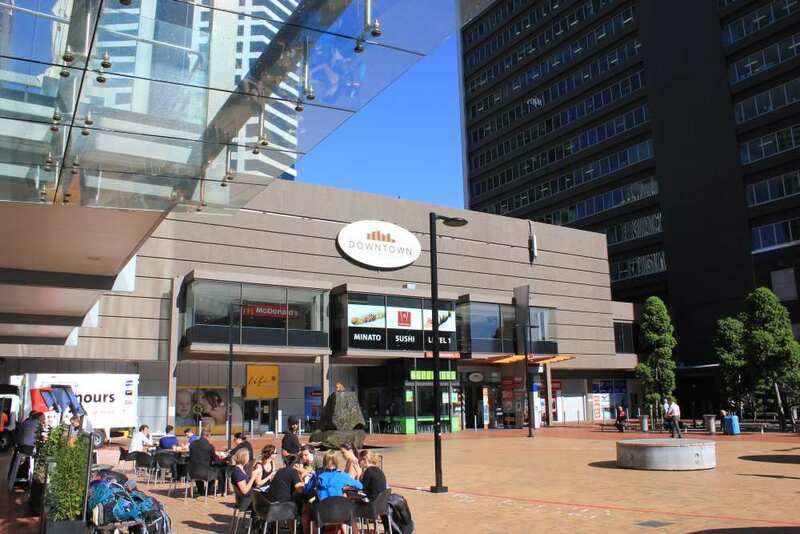 Queen Elizabeth II Square was opened in February of 1980 by Auckland Mayor Sir Dove Myer Robinson as part of work to create more public spaces. Comprising the entire area of Lower Queen Street this pedestrian only environment was first put forward in 1964. In this year Molly Macalister was also commissioned by Auckland City to create a statue. Completed in 1967 it featured an interpretation of a Māori warrior as a welcoming figure to those arriving from the downtown wharves. This was erected in the wide centre median of Lower Queen Street on a 2m high pedestal. During development of the square the statue was put on a lower pedestal, closer to the Quay Street end of the square. In 1971 Michio Ihara created a stainless steel sculpture, Wind Tree for the Auckland International Sculpture Symposium. This was put into Queen Elizabeth Square in 1977. 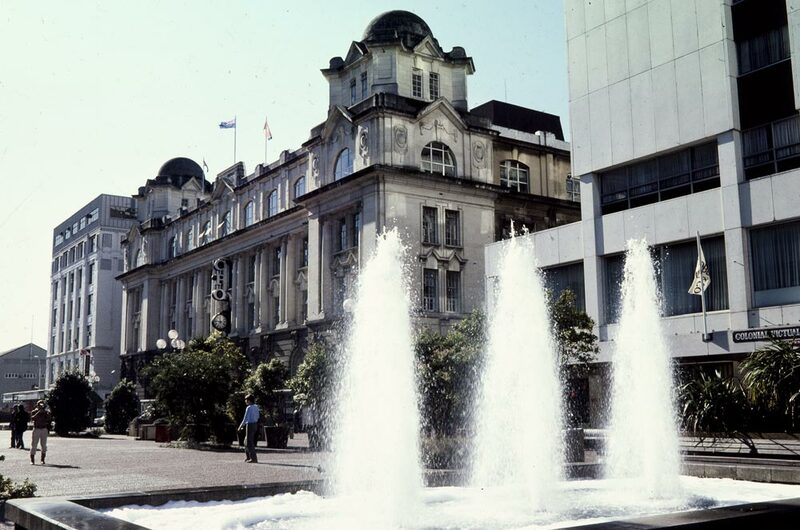 Queen Elizabeth Square also featured an installation of trio fountains on the southern side which were known as the Coutts Fountain. 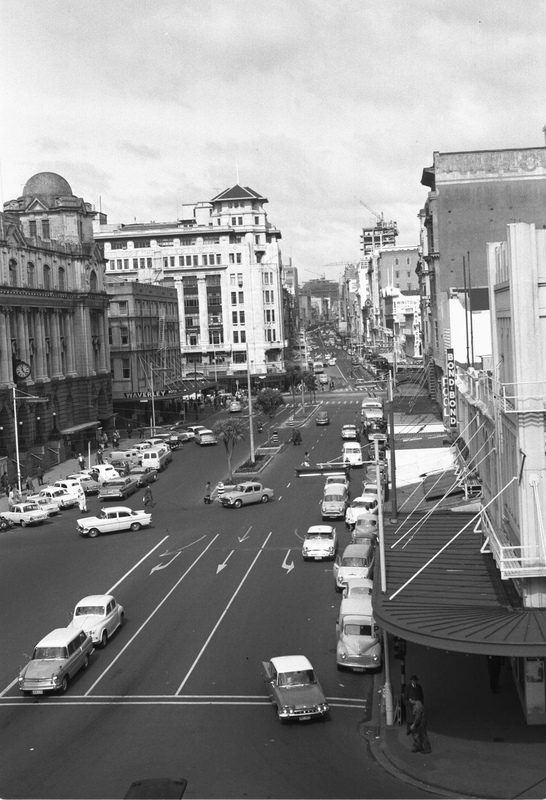 Ref: Eric W Young, Looking south along Queen Elisabeth Square, 1980s, Sir George Grey Special Collections, Auckland Libraries, 1021-207. Ref: Eric W Young, Looking south east across Queen Elizabeth Square, 1980s, Sir George Grey Special Collections, Auckland Libraries, 1021-503. 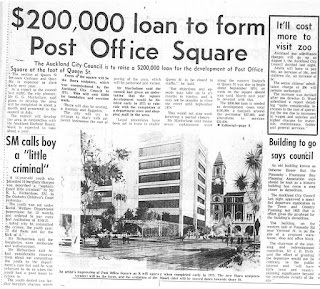 The post office closed in 1992 and was purchased by Auckland City Council in 1995. In 1995 the space began to be discussed as being used for a transport hub. 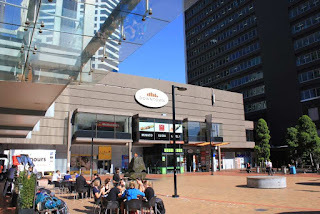 Rail was put into the CPO building and an underground walkway created which connected pedestrians to the other side of the Lower Queen Street and to the remaining piece of Queen Elizabeth Square nestled against the Downtown Shopping Centre. Britomart Transport Centre was officially opened in 2006. With the road re-opened to accommodate the bus terminal, the Māori chief statue was relocated to Quay Street in 2000 and then to its current position opposite the Ferry Buildings. Coutts Fountain was removed and the Wind Tree sculpture was put into storage with its new position in Wynyard Quarter first revealed in 2011. The sculpture installed in 2004, ‘Te Ahi Kaa Roa’ by Ngati Whatua ki Tamaki’, occupied the southern part of the smaller Queen Elizabeth Square until the Square’s closure this year. 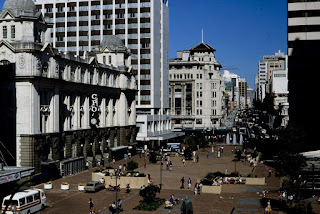 Ref: Matt Elliott, Downtown Shopping Centre, Auckland, December 2015, Sir George Grey Special Collections, Auckland Libraries, 1385-110. Lower Queen Street has changed significantly over the years, and is now undergoing another transformation as the City Rail Link tunnels are put underneath. The bus terminal will be moved and Lower Queen Street pedestrianised once more. Until the new space is unveiled it currently functions as part-construction site, part-pedestrian zone..